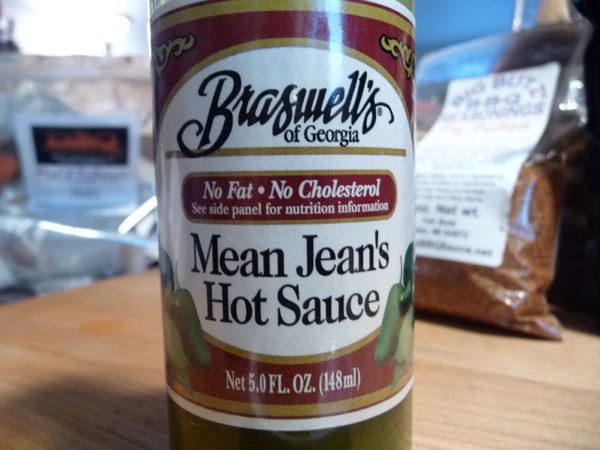 To kick off our Week of Mild we begin with what is probably the mildest, yet somewhat tasty sauce in our fridge – a green jalapeño and vinegar based sauce from the venerable house of Braswell’s of Georgia kitchens. Mean Jean’s Hot Sauce is your basic green chile, jalapeño and vinegar concoction. Very mild to say the least, but it earns the first spot in our Week of Mild series as it’s readily available in many grocery stores as well as online. OK, that’s a big list of ingredients. Needless to say, this is not an all natural sauce. But we do get tons of comments and inquiries about mild sauces. Everything from the wife whose husband loves hot sauce, to the guy that just wants some spicy sauce on his pizza or tacos or nachos. This sauce is not that bad, and would be a great beginner sauce for those newbie chileheads out there looking for a green jalapeño based sauce. Yes there are much better choices out there from small craft makers, and if you stay tuned to HotSauceDaily.com you will see what we mean. Texture & Appearance: It’s got that shiny, sticky appearance you get from store bought sauces. Flakes of peppers or ingredients float about in it. Not impressive, but we’re not talking hand crafted sauces here. Taste Straight Up: There’s a big hit of vinegar first, then the peppers. It’s not complicated. Just slightly sticky or gummy, but quite pleasant overall. I can imagine a monkey dish of this sauce to dip jalapeño poppers into. This sauce would rock at your neighbors’ party with chips or poppers. We’re not trying to change the world. Heat Level: – Very mild. Slight tingle on the tongue, but very tame overall. All of the Braswell’s products are available on the Braswells.com site.